Rose Falls is always a popular stopping point on this route, and the cliffs above the falls should not be missed. If you want to hike you can take the Border Route Trail and explore old cedar groves or other overlooks into Canada. Duncan Lake, Rose Lake and South Lake are all good Smallmouth Bass lakes. South Lake is usually very quiet and has a quintessential remote BWCA feel. If you paddle this route you will have a chance to portage the historic Height of Land Portage where early Voyageurs had their initiation ceremony. Many people like to base camp on Duncan Lake or Rose Lake. 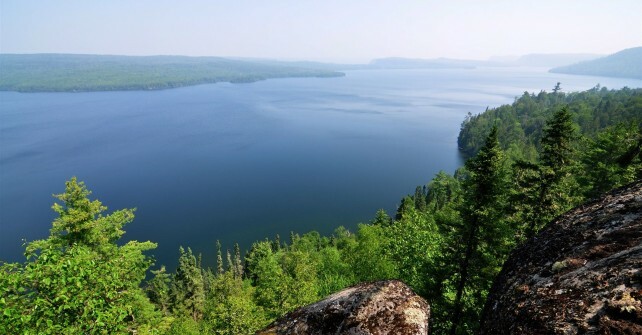 North Lake offers great Lake Trout fishing in the spring, and the waters flowing between Little North and Gunflint Lakes are consistently filled with Walleyes. We recommend this route be traversed West to East, as winds from the West can make trecherous travels on Gunflint and South Lakes.